Abstract: This post studies the time lag in global warming following incremental increases in CO2 forcing. It uses a GCM  to parameterize these “inertia” effects which are mainly due to slow ocean warming and ice melting. The Mauna Loa CO2 data  is used to calculate annual temperature changes for different net climate feedback values by using the observed annual increments in radiative forcing. These temperature changes are then compared to the HADCRUT3 temperature anomaly data , to determine the range of feedbacks compatible with the data. Finally the IPCC A1B (business as usual) scenario for future CO2 emissions  is used to predict long term global warming. After 2100, it is assumed that alternative non-carbon energy sources (Nuclear Fusion) take effect to greatly reduce net emissions leading to a gradual fall in CO2 levels back to current values by 3000 as the Oceans slowly re-absorb excess anthropogenic CO2. By then the Earth will likely have begun a gradual cooling phase leading eventually to the next glacial period. Recently Willis Eschenbach wrote an article on WUWT A Demonstration of Negative Climate Sensitivity using CERES data to show evidence of negative feedbacks in the tropics. He was criticised in one of the comments because he was assuming an immediate temperature response to a change in forcing. The oceans take decades to warm to a new equilibrium value. I have also been criticised likewise for fitting global temperature anomalies DT(t) dependence to a logarithmic CO2(t) dependence. Here I will try to look in detail at this “warming inertia” problem. The result of this fit is shown in figure 1. yielding an e-folding time of ~ 15 years. This parameterization is then assumed to represent the overall climate response to any sudden change in external forcing. We can therefore use this formula to calculate the temperature response year by year to AGW based on actual Mauna Loa CO2 data . I have used a smoothed version of this data and then extrapolated backwards to pre-industrial values at 1750 . The trend data used in the calculations are shown in Figure 2. Fig 2. 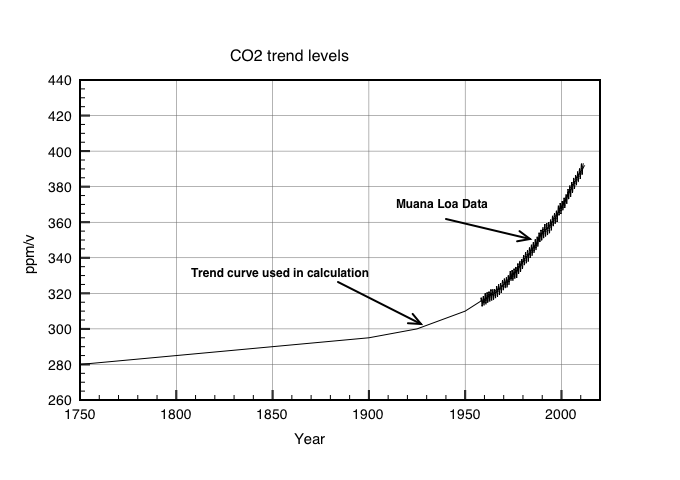 CO2 trend curve based on Mauna Loa data. We assume that a pulse of CO2 is emitted to the atmosphere once a year. The quantity of CO2 is calculated from the Mauna Loa data shown in Fig 2. Each pulse is then tracked through time according to equation 1. The radiative forcing corresponding to each pulse is calculated using the canonical formula . , where C and C0 are the values before and after the pulse. Calculations have been done for 3 different net climate feedbacks to the measured Mauna Loa CO2 forcing in the above model. This assumes that all the observed temperature anomaly trends are due only to CO2 forcing. The results are compared to the observed HADCRUT3 anomaly measurements in Figure 4. Fig 4: Comparison of data with 3 feedback scenarios in the standard CO2 forcing model. The data favor a positive feedback of about 2 watts/m2K-1. A lower value of 1.5 Watts/K-1 is not ruled out while 2.5 watts/m2K-1 is incompatible with measurements. Therefore assuming that the only driver over the last 160 years was AGW (see below) this study confirms that a feedback of ~ 2 W/m2K-1 is supported by the data. 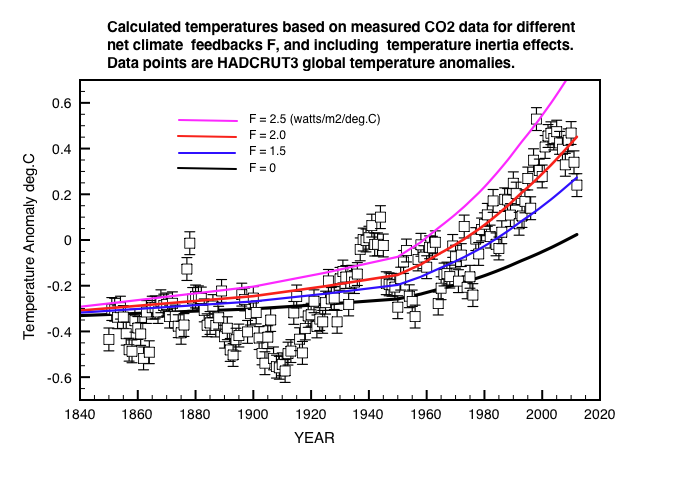 This corresponds to a climate sensitivity of 2.1 deg.C for a doubling of CO2. The current CO2 content of the atmosphere would also then lead eventually to a warming of ~ 1 deg.C after the planet systems equalise. Of course CO2 emissions will continue beyond 2012 as we will investigate next. There is however, also evidence in the data of a 60 year oscillation superimposed on top of an underlying AGW trend . The observed halt in warming since 1998 would then be due to a turnover from a peak in the oscillation around 1995. This slow down would then likely continue for another 20 years as natural cooling counteracts warming, in which case feedback values of 1.5 watts/m2/deg.C or less would be favoured. Another 10 years of data should be sufficient to decide this. Most scenarios for the future stop at 2100 with seemingly disastrous consequences for life on Earth as temperatures apparently continuing to rise ever faster into the future. Such warming cannot possibly continue for ever because 1) fossil fuels will run out or become uneconomic 2) Large excesses of CO2 will eventually be absorbed in the Oceans over time periods of several 100s of years at a rate that increases with concentration (partial pressure). Therefore I will take a much longer term scenario which follows the (business as usual) IPCC model A1B  until 2100, but thereafter assumes that abundant non carbon energy sources such as Nuclear Fusion become widely available. This gives mankind a further 90 years to finally get Nuclear Fusion power generation to work, leading to a gradual reduction in CO2 levels from 2200 onwards. I seriously doubt that current low density renewable energy alone can ever maintain a technically advanced society. Fig 4: Long term predictions assuming non-carbon energy sources post 2100. The 4 feedback factor curves labeled F use the same calculations as described above based on the red CO2 level curve labelled A1B. 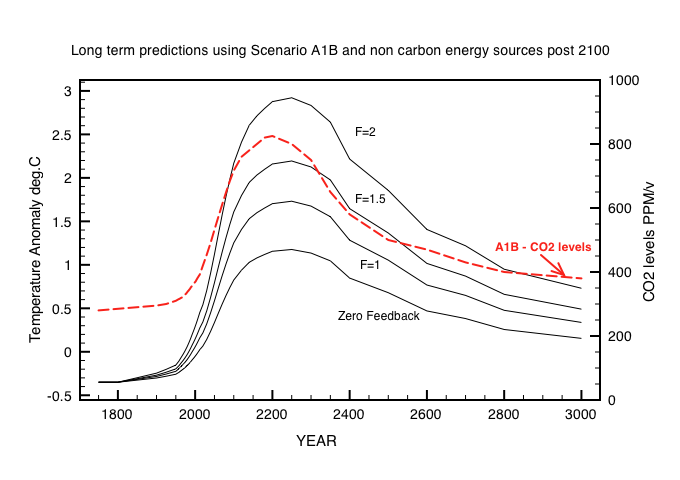 Figure 4 shows the future scenarios based on an A1B future CO2 levels which stabilize by 2200 at around 800 ppm with the replacement of fossil fuels by non carbon sources. Thereafter CO2 levels fall as ocean sinks absorb CO2 over ~ thousand year lifetime. Here positive feedbacks work in reverse accelerating temperature reductions. By 3000 the Earth’s climate is more or less back to where it is today. By then cooling towards another glacial period may well have already begun, in which case raised CO2 levels will be an advantage ! 1. Time lags in the climate system response to any increase in radiative forcing have been parameterized using a GCM. This gives an e-folding reaction time of about 15 years. 2. A Calculation of annual warming due to measured Mauna Loa CO2 increases taking into account time lags favors a climate feedback value of 2 W/m2K-1 if post 1958 warming is entirely due to CO2. If instead a 60 year oscillation is superimposed the feedback value is likely 1.5 W/m2K-1 or less. 3. A prediction can be made for future long term temperatures calculated using IPCC scenario A1B for future CO2 levels. It is assumed that after 2100 emissions fall as non-carbon energy sources are adopted leading to a gradual fall in CO2 levels as the Oceans re-absorb excess CO2. The peak rise in temperature then occurs around 2250 with a maximum increase above pre-industrial levels of 3.4 degrees C. Thereafter CO2 levels and temperatures slowly revert to natural levels over another 1000 years. By that time we will probably have the onset of another major glaciation to worry about. This entry was posted in AGW, Climate Change, climate science, Science and tagged AGW, CO2, Feedbacks. Bookmark the permalink. I just picked up on this from you link on WUWT. It’s an interesting approach. However, I have just been looking at how rate of change of atmospheric CO2 relates to temperature. This is the basic physics of out-gassing as water temperature rises. The short term variation shows no lag and this is in accord with the fact that it only takes about an hour for water/gas samples to reach equilibrium when agitated. (About 3h is still). Here a somewhat variable lag of between 0.5 and 1.5 years is seen. Since the reaction is almost instantaneous this is likely due to delays in mixing with deeper water. Now both those plots suggest that the GISS model’s response time is way too long. All physical evidence (such as absorption of bomb test C14) is that atmospheric CO2 has a residency time of about 5-7 years. Climate models all seem to base their CO2 turnover on Revelle’s rewriting of science on this that is theoretical and contrary to experimental evidence. What does your method give if you use a value of say 6 years instead of 15 years ? The basic argument for a long time lag is the huge heat capacity of the deep ocean. So the deep oceans take decades to reach a new equilibrium temperature profile. Heat is absorbed over long periods. I agree that GISS over-exaggerates warming and its results are unreliable. I am only using the model to fit the thermal time response. Thanks , I was confusing the 15 with that of assumed CO2 time constant. Is it a coincidence that this is the same ? Yes but this is precisely the response to a massive pulse of CO2 so it is primarily the result of the CO2 (that is the point of this test). Now if CO2 is reckoned to have half-life of 15 years a lot of it will still be active in the atmosphere after 15 years. That the model has a thermal time constant very close to this (and not longer) suggests that the CO2 residency is dominating the thermal response time of the system. 99% is 5 time constants so it will take decades to reach a new equilibrium even just on grounds of CO2 absorption at the official rate. Arguments about deep ocean turnover must involve at least 3 different time constants and volumes. The deep water may extent the tail and the last couple of % but the surface response time must be notably shorter that the 15y CO2 constant since the response is the same. It’s unfortunate that this does not give the clear cut test I had thought it would. It would still be good to have a idea how 6 years CO2 time would affect your calculation. 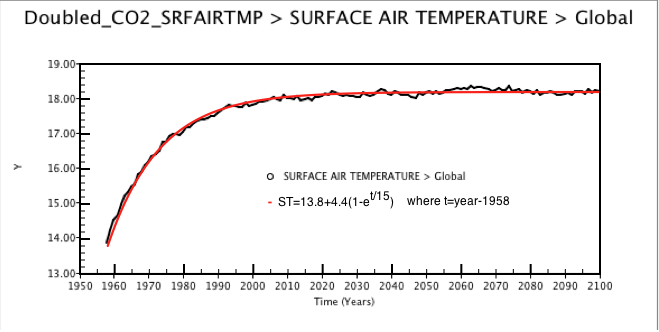 That is of course the temperature response of the model not the earth’s climate. And that model does not fit post 2000 temps so there is a good reason to reject it’s temperature response. Since the key factor determining residence time is the Revelle model it would be a good place to start, replacing the residence time with one based on experimental data. since it would presumably be trivial for you to plug a different value into your model it would be interesting to see the result. I hope you will find that worth trying.